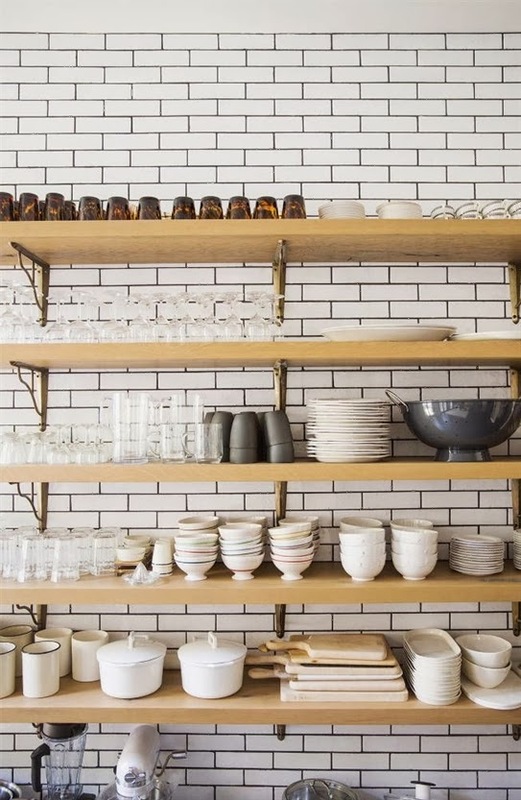 To tile or not to tile, that is the question? Well, not exactly 'my question', I want to tile but which tile is my question? 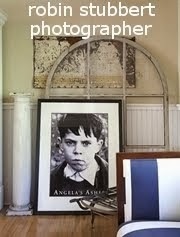 If you have been following my blog you will probably have read I am planning to renovate my kitchen. It was meant to be ready for Christmas, however a rather high quote for replacement doors and bench tops has led me to the decision of a complete 're-design'. 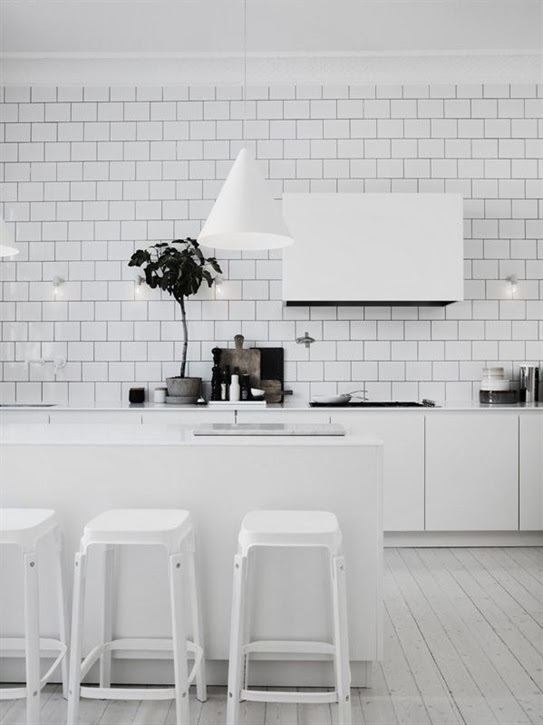 I've been dreaming of a kitchen similar to the one made famous in the movie 'Somethings Gotta Give' and was going to use simple white subway tiles, but after viewing tiles first hand, its not as easy as I had envisaged. 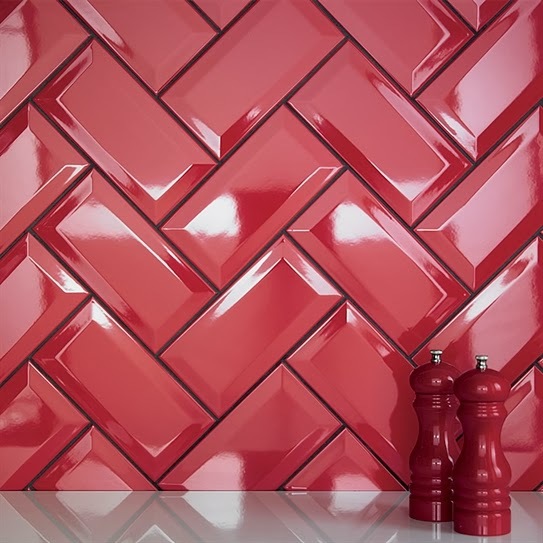 Subway tiles come with straight or bevelled edges and once you have decided on your tile shape, you then need to select the finish, as gloss or satin will each achieve a very different look. 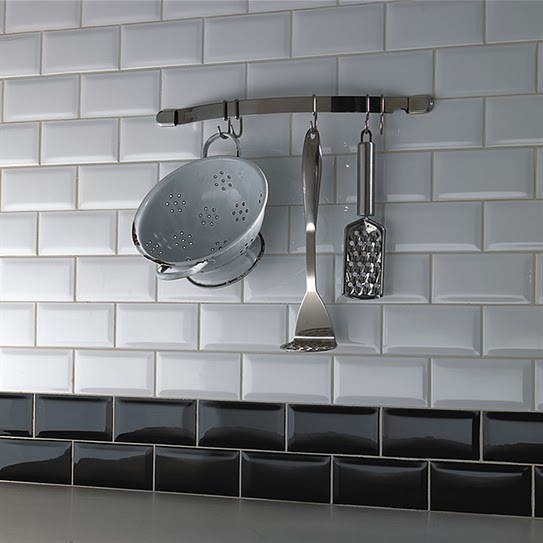 Subway tiles can also be laid in different ways as you will see below. Where does this style of tile originate from? My childhood memories took me back to London's underground lavatories...eeww! However as the name suggests, they are derived from the tiles that lined the subways in early 20th Century New York. My existing kitchen has a stainless steel splash back installed by the previous owners. I can see the reasoning for hygiene, however it is the bane of my life when it comes to keeping it streak free, not to mention it doesn't work with my decor in this open plan living area. High gloss tiles can be easily cleaned, and modern BAL grouts with Microban technology prevent the growth of bacteria. It is important therefore, if you decide to tile your kitchen, make sure you use a grout that contains this technology. If you are not sure about what colour to grout your tiles, The Yorkshire Tile Company have a nifty, 'grout selection tool' that allows you to choose a tile design and then try different colours of grout to see the effect before you buy. 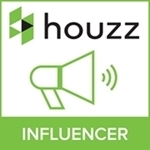 This tool is on their website and free to use. 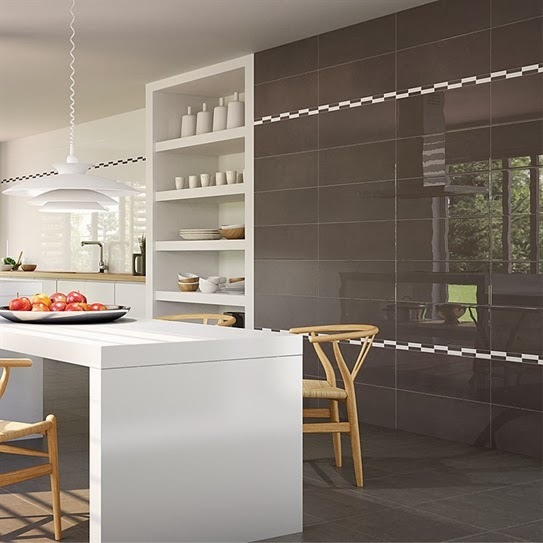 Above: Bevelled edge tiles will suit both traditional and contemporary styled kitchens. Breaking up the white tiles with a double row of black tiles, looks smart and less clinical. You could also use darker grout between the tile if you are worried about discolour. 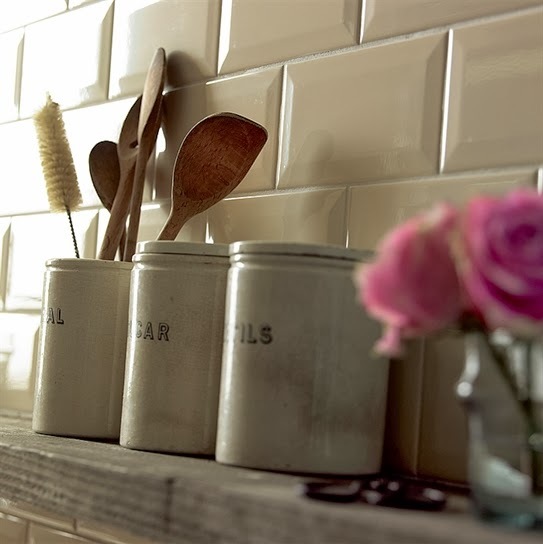 A pale grey grout works wonderfully with sharp, white tiles, ultimately grout colour is a personal choice. Hence a good idea to use the grout tool I linked to above. I think the bevelled edges soften the look. 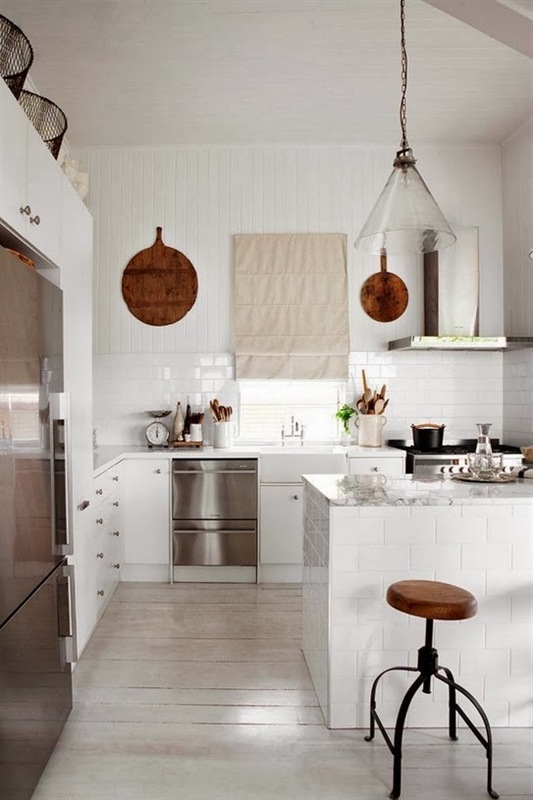 If using all white tiles, an off white such as alabaster, will look less sterile. 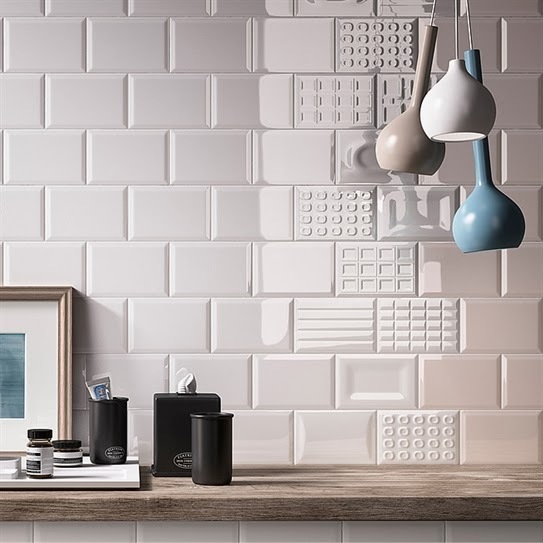 The relief patterned tiles above add texture and interest to the surrounding white, gloss subway tiles. They have a Scandinavian feel about them and would work well in a contemporary kitchen. Flat sided tiles in a semi gloss. 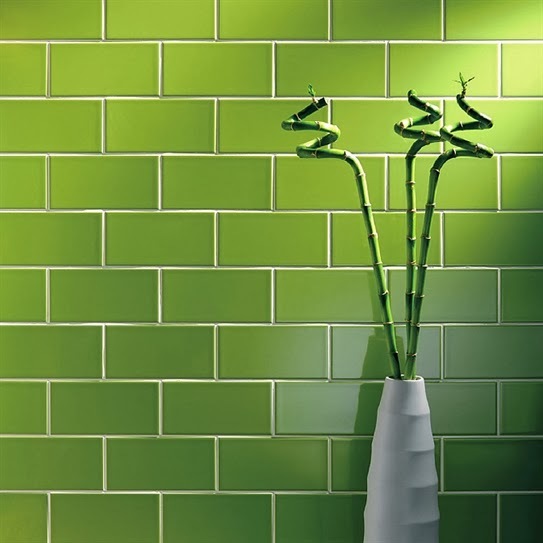 Remember when 'avocado' was all the rage in bathrooms, I actually had a bath and vanity in 'avocado', very similar to the colour of these tiles......eek! Although I wouldn't use the colour again, it is nice to see this shade returning as it actually looks acceptable as a subway tile and this green has more depth to it. High gloss tiles laid adjacent to each other achieve more of a seamless, contemporary look. Images and tiles above from the The Yorkshire Tile Company. 1. A modern kitchen with smaller subway tiles and grey grout. 2. 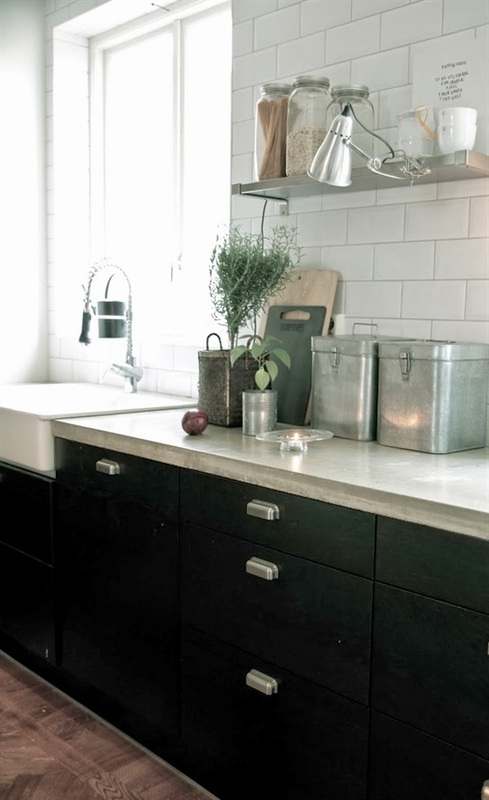 Subway tiles work nicely with the concrete benchtop in a kitchen I would describe as country versus industrial. 3. A traditional 'subway' look, the dark grout makes the pattern quite distinct. Use a grout matching the colour of your tile if you want a subtle look. 5. 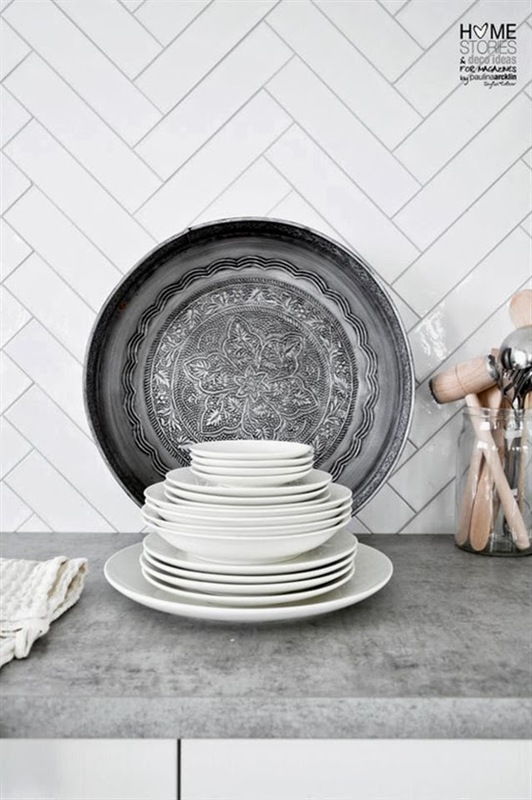 Black subway tiles in a more natural, rough, buffed finish, add interest by way of texture. I really like the way they have combined colour, texture and pattern in this kitchen. Am I any closer to deciding my tile? I am pretty sure I will choose bevelled edge subway tile, colour, possibly alabaster, I have not yet decided on the finish. I will wait until my plans are drawn up and listen to the designer, but at least I have narrowed it down to a subway tile. 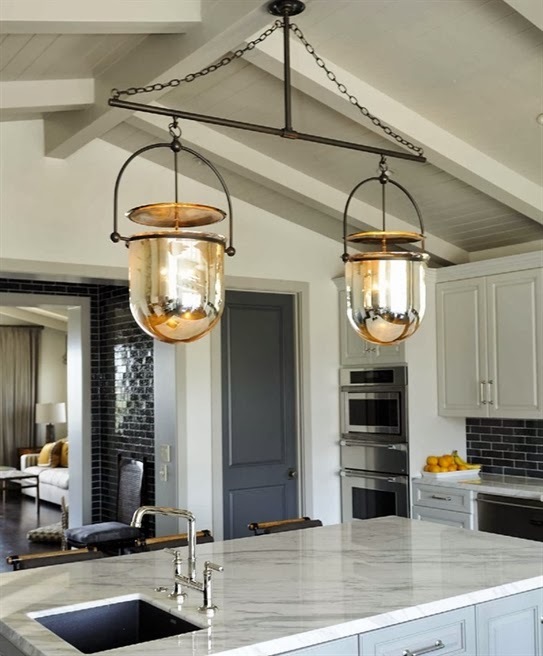 If you are thinking of updating a kitchen or bathroom with subway tiles, I hope you found this post helpful. Once work starts on my own kitchen I will be sharing the project from design to completion. If you don't want to miss out you may want to sign up for email updates (on my sidebar) which will come straight to your inbox. Like you Lee I've been going back and forth between subway tiles and granite for my 'Hampton inspired' home near the beach north of Auckland. I've finally convinced myself to do tiles, despite everyone telling me how awful they will be to keep clean! Now I'm just deciding on bevelled or plain, and like you am leaning towards bevelled. 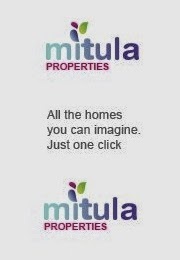 Can't wait to see your new kitchen. 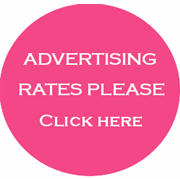 Hi, thank you for taking time to comment :). I love Hamptons style, a perfect look for a beach home. If I didn't have my huge Korean cabinet in my living area, I would probably lean towards Hamptons style as it's very easy to live with. I am probably going with Roxx stone for my work tops and tiles for the splash backs, I am definitely having the bevelled edge ones, I think they look really lovely. As for the grout, I am not yet decided, I am worried that very light may yellow but dark is not the effect I want. Lots of decisions. I am still at the planning stages so it will be a couple of months probably before I have it installed. As soon as things start to progress I will be blogging each step. Would love to see your new kitchen once installed too. I have a Roxx benchtop courtesy of the previous owner and it is fantastic. We have a white with silver and very light grey fleck. It is fantastic and can totally recommend it. What a co-incidence, I am glad you said it is fantastic as it has taken me ages to decide on the actual bench top material, I am tossing up between, Irish cream and Cartel. 'Cartel' is an off white with a subtle speckle of beige. The Irish cream is more of a grey with a hint of beige and green if that makes sense with darker flecks. I will probably end up with the lighter colour and may look at the one you are describing. We have certainly seen a big increase in the subway/metro style tiles this year. We stock the Michelino tiles which are the third image down with the relief pattern decors. They are very popular as people reject the standard 10 x 10cm kitchen tiles in favour of these more interesting designs. Long may it continue.